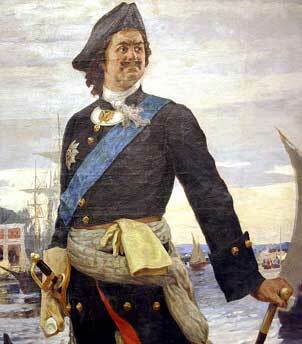 Peter the Great was born Pyotr Alekseyevich on June 9th 1672 in Moscow. He was the 14th child of Czar Alexis by his second wife, Natalia Kirillovna Naryshkina. He was a very tall man, indeed some sources say his height was more than 2 metres. His clothes size was 48, he had narrow shoulders and a small head compared to the rest of his body. He took size 38 shoes. He had a healthy childhood but there were rumours that his mother may have been unfaithful to Alexei Mikhailovich Romanov (Czar Alexis) and he was her first child. He had 13 half siblings most of whom were weak and sickly. The Czar Alexis died when Peter was just four years old. Peter's second wife became his favourite. Her name was Marta Samuilovnova Skavronska and was the daughter of Samuel Savronsky, a Roman Catholic peasant from the Polish-Lithuanian Commonwealth. She became Catherine the First of Russia. Peter listened to her advice and often discussed important state affairs with her. In his youth, Peter made a two year trip to Holland and other western countries and returned with a variety of ideas. For example, he ordered skates to be fixed to shoes with rivets, as previously, shoes and skates had been fixed together with ropes and belts. From Holland, Peter brought tulips, which appeared in Russia in 1702. A garden office was established for the distribution of overseas flowers. He was very interested in the sciences, especially medical science. Most of all, he was interested in dentistry and enjoyed trying to help some of his associates. In his enthusiasm, he often got carried away and removed healthy teeth. He had a very clever punishment for counterfeiters, who 'served their time' by working in the state mints, so that in 1712, thirteen such craftsmen were sent for employment to the mints. Peter is regarded as a 'moderniser' who forced changes upon his subjects. In 1846, the Russian historian, Nikolai Pogodin wrote ' The Russia of today, that is to say, European Russia, diplomatic, political, military, commercial, industrial, scholastic, literary - is the creation of Peter the Great."